I've tried a little matchstick quilting. My scrappy log cabin has 7 rows and in each row one block is quilted with something other than spirals. This is the last one of the different blocks, leaving me with only 6 blocks left to quilt with the spirals. Plus sashing and borders, of course. Someday this will be finished. Matchstick quilting is supposed to feature straight-ish lines and mine certainly have the emphasis on the 'ish' part of that, as seen clearly from the back. Still, for a first attempt, I think they're passable. I do like the texture this style of quilting adds and I'll probably give it another go on a larger scale sometime. Last night I stitched most of the quilt top for my And Sew On wallhanging. Only the borders left to add! I'll be hosting TGIFF at the end of the month and my goal is to have this as my finish that day. How's that for incentive? Have you entered my Anniversary Giveaway yet? If not, click here. I link to these places. I love you fabric choices for the blocks. Mine were totally different and not as realistic. You did great! I love the matchstick quilting, must give it a try. Your And Sew On top looks great too, I am sure you will meet your deadline! 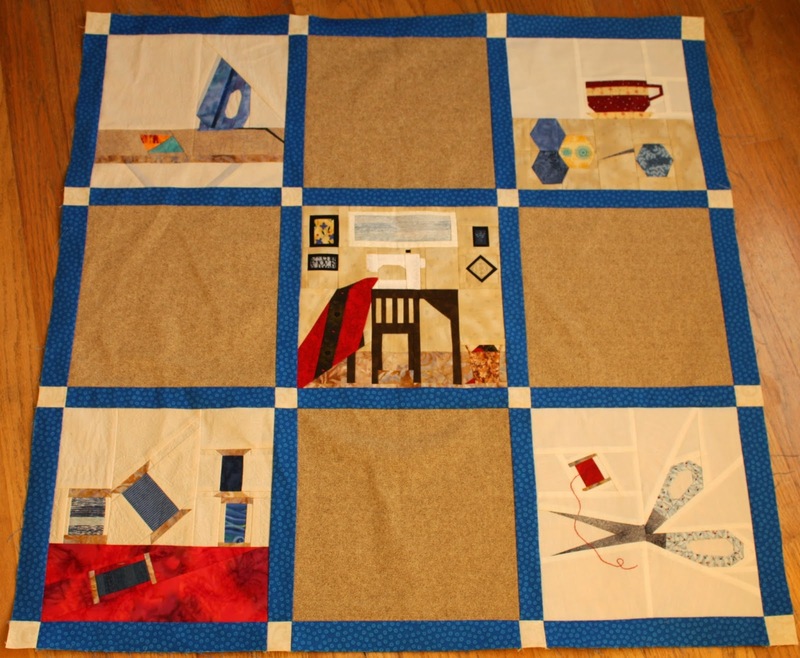 The variety of quilting styles in the same quilt works well for this project. Your paper piecing looks great too! Your FMQ is so pretty. I really like that double flower. I will have to give that and the matchstick quilting a try sometime. The matchstick quilting and the quilt top both look great! Good luck with your finish! I love the matchstick texture, as well. This looks great! Love matchstick quilting but have yet to try it myself! Your And Sew On quilt top is looking great! Hope you have better luck getting your finish done than I did (tehe). Love that BOM that Kristy did. Are you doing her new one? love the quilting, and LOVE the wall hanging!